These watercolor blocks contain professional-quality, acid-free paper that offers excellent absorption and color rendering. The paper is mouldmade from 100% cotton fibers. The durable 140 lb (300 gsm) white sheets are ideal for all wet techniques, including watercolor, gouache, acrylic, ink, and calligraphy. Each block contains 12 sheets and is bound on all four sides, perfect for plein-air painting. 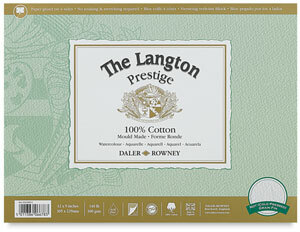 Langton Prestige is a 100% cotton, artist and conservation quality paper. 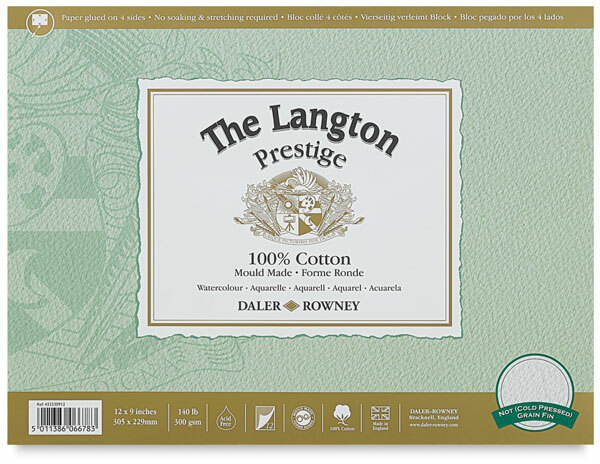 Manufactured with extra l ong fibers for durablility and strength, these sheets can take heavy color washes without buckling.